VENICE — A large banner depicting Paulo Freire’s head, the Brazilian educator and author of Pedagogy of the Oppressed, hung high on one side of the of Teatro Alle Tese, as if overseeing the audience. Other banners, all handmade, lined the rest of the theater and literally set the stage for the 7th annual Creative Time Summit: The Curriculum. 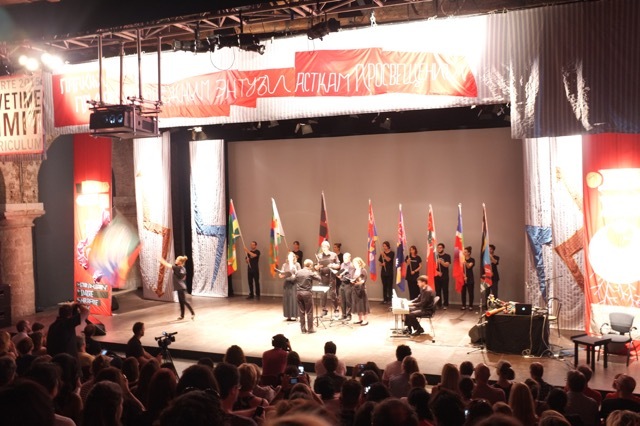 Inspired by how the Soviet Houses of Culture decorated community gatherings and halls, the collective Chto Delat created “designs that were intended to greet visitors and didactically encourage them to participate in the event’s agenda.” Each carefully crafted piece introduced the various themes of the three-day event and created a backdrop for the stage in Teatro Alle Tese. On the right of the stage, sound artist Francesco Gibaldi had set up a makeshift studio with a bicycle, horns, PVC pipes, squeaky pigs, and other industrial materials he played to keep the presenters to their time limit. At the Summit, Chief Curator Nato Thompson described this year’s theme, “the curriculum”: “It singled that which prepares a person for working, thinking, and participating as a fully developed member of society. When understood as a network of lived experiences, learned actions, and known facts, curriculum speaks to all that this Summit hoped to address.” The theme was considered in many ways: as form, content, institution, and pedagogy. The state of world affairs demands a response and analytical lens in which an exhibition can become a kind of thinking machine … an exhibition format, as form of public discovery, of art’s potential in the face of difficulty and the inscrutable …. An exhibition is something that happens in the world — and carries with it the noise, pollution, dust, and decay that come from that world. So began the Summit: three days packed with high-profile keynote speakers and presentations on intersections of social justice and politics in the context of “the curriculum.” I mention only a few highlights here. While Enwezor’s introduction to the Summit left us thinking more deeply about the possibilities of the exhibition as an important site of public discussion and dispute, Amy Goodman from Democracy Now! gave a passionate keynote in which she grounded the Summit’s physical location, the Arsenal (one of two major exhibition sites at the Biennial), as the former site for maritime ship and weapon production in the 12th century. She took us on a poetic journey through recent tragedies that brought to life the Black Lives Matter Campaign. Her address was not abstract but grounded in stories of injustice to which art must serve, not just reflect. Her most provocative quote — one that I think everyone could still recite — was: “Riot is the language of the unheard.” Goodman’s persuasive words galvanized the audience — many of us had a visceral reaction that brought our bodies into the room. The Democracy Now! team continued to broadcast from the Summit and interviewed key speakers Miriam Ghani, Emily Jacir, Anne Paternak, and Thompson. Next up, the Mexican, US-based artist Pedro Lasch discussed how the relationships “between labor and slavery, military history of the Arsenale, pain and suffering that nations inflict, and the pain of trying to create a nation” formed the conceptual groundwork for his “Abstract Nationalism and National Abstraction.” Forty-eight flags hung in the theater’s entrance, each flag a different combination of four countries. For his performance “How to Know: Protocols and Pedagogy of National Abstraction” color guards used the flags onstage in a choreographed procession and singers delivered “the anthems of all four countries simultaneously, each sung in the langue of the country that following it alphabetically.” By mixing up anthems and flags, such as in “Composition 20 Indonesia, Iran, Iraq, Ireland,” the work challenged those countries’ displays of nationalism. Day one’s events “A Curriculum’s Contents” and “Educational Institution as Form” revealed how artists use strategies to circumvent local and state policies by working with local groups to create new institutional forms, such as the International Academy of Art Palestine and the Arts Schoolaboratory, which spreads learning through networks of “unlearning.” For the “Curriculum’s Contents,” Palestinian-American artist Emily Jacir described her ‘failed’ (accepted but ultimately never realized) 2009 Bienniale project that inserted Arabic signage onto the Line 1 Vaporetto stops to highlight the cross-fertilization of the Arabic world with Venetian culture and economy. Charles Gaines walked us through his proposal for a temporary installation at the park base of the St Louis Arch that would use moving chains — signifying commerce, slavery, and trade — to underpin American history: the Arch as a gateway to the expansion of the American frontier through a belief in Manifest Destiny. 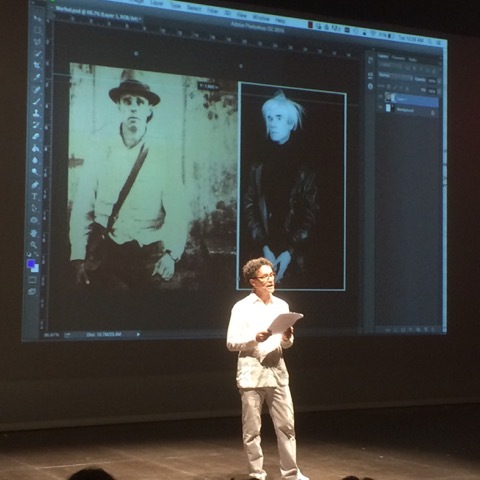 It is a testament to Thompson’s curatorial flair that he bookended the first day with compelling and visceral keynotes and presentations. If Amy Goodman delivered her keynote with intensity and urgency, it was 18-year-old Joshua Wong who inspired many to their feet. As a student activist and founder of the student activist group Scholarism in Hong Kong, Wong demonstrated remarkable courage during the Umbrella Revolution and at the Summit reminded us of the collective dream of change, which must be instilled early, and declared that his generation might just be the one who wins the war against “brainwashing of national education” and develops new forms of democracy in Hong Kong. Mina Setra moderated the “Geography of Learning,” which offered transnational perspectives on indigenous populations — an issue that is often left out of discussions about art and social justice. Michael Gerace (Re-Locate Kivalina) described the displacement and subsequent strategies used when an indigenous whaling community in Alaska refused the state’s offer for relocation due to climate change. The session closed with a stunning presentation by Jolene Rickard who showed the curatorial strategies that she and her allies use to address issues of indigenous communities worldwide. Thompson deemed day three “discursive” day. 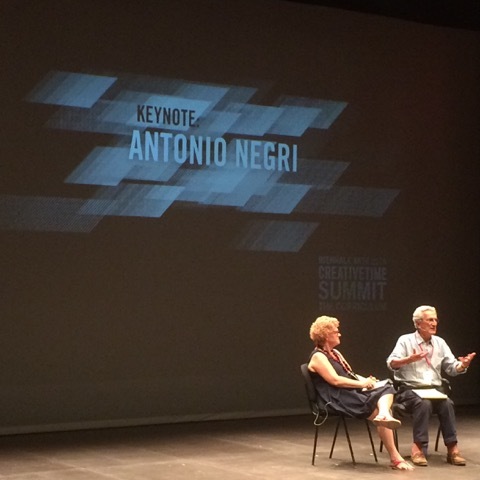 The Italian sociologist and political philosopher Antonio Negri started our final morning by challenging how we perceive and subsequently present ourselves. He asked that we consider a revolutionary cultural practice that involves shifting from individuals to “singularities,” from community to an “alternate commons.” Then came one of the Summit’s most anticipated events: Shannon Jackson moderated “The Bienniale as Global Curriculum: Creative Time in Venice,” a conversation between Gaetane Verna, Ahmet Ogut, Mel Chin, and Dimitry Vilensky. Jackson’s introduction threaded together some of the questions posed throughout the summit and asked: “How can we negotiate the paradox of the Summit in the Bienniale and vice versa?” The panelists answered with provocative statements. Artist Mel Chin described an “aesthetics of adaptation” as a way for Creative Time to be effective in the world. Instead of teasing these questions out through conversation amongst the panelists, however, audience members were invited to ask questions, and, as a result, the conversation never fully developed along the original statements. The democratic gesture aligned with the audience engagement mandate for the day, but it was a missed opportunity for a deeper conversation among the panelists. One of the Summit’s special projects achieved this kind of exchange daily. The PRESS Room (curated by Maurice Carlin, Robert Frankie, Pipa Koszerek, and Jade Montserrat) formed a temporary community, which met early each morning of the Summit. 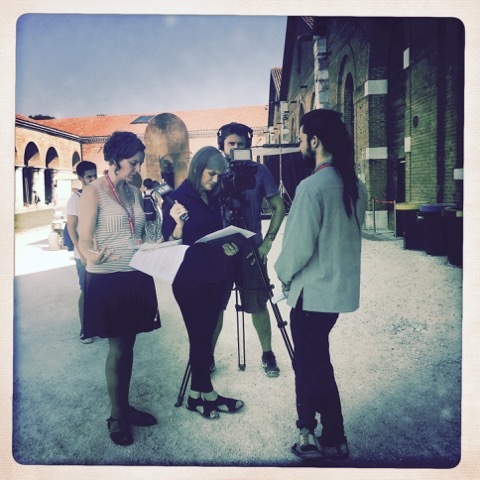 In the breezy courtyard of the Welsh Pavilion adjacent to the Arsenale, members of the PRESS Room met to discuss and eventually respond to a guest editor’s prompt. This subtle intervention opened up more intimate, discursive space missing from the Summit (but understandably, given the scale). One of the questions, from artist Simone Leigh, was: “If the World’s Fair Pavillions were a recreation of the colonial project while it was still happening, what does the Venice Biennale do?” And artist and writer Miriam Ghani asked: “Can a biennale ever enact politics, or can it only ever represent them? Why, or why not?” Such a question gets to the crux of the some of the challenges posed at the Summit. As if to respond to this very question, members of Public Studio, instead of giving a workshop as requested, introduced the Migrant Choir, who sang anthems of nations that had colonized their nations, starting with the Italian National Anthem in front of the Italian Pavilion (their performance also brought another layer to Pedro Lasch’s earlier performance). The Summit concluded with accolades: the incredible feat of another successful Summit. No doubt Anne Pasternak, Nato Thompson, and Sally Szwed’s vision continue to support artists and their allies, as well as give voice to them in a public forum, and ultimately contribute to building a movement for social justice. The Summit, however, lacked a final recap, someone or some activity to draw the themes together, to pose further questions and send us away with a mandate. I also wanted to hear more about messiness, challenges, failures, and strategies for funding socially engaged projects. Overall, the Summit, because of its conventional formatting (keynotes and 10-minute presentations with one question from the moderator), felt a bit didactic in a traditional pedagogic sense. There was limited room for shared learning or dialogue. With such a wealth of experience and knowledge on the stage and in the seats, there could have been more exchange. I continue to wonder how Creative Time can avoid being completely absorbed into art world structures. Generally on the periphery of the art world’s locus of power, yet provisionally at its center with this year’s Summit, Creative Time is, as Enwezor put it, responsible for being a “vehicle for public discovery” and is an important “site of disputes” that hopefully helps to unravel how institutional power is constructed. 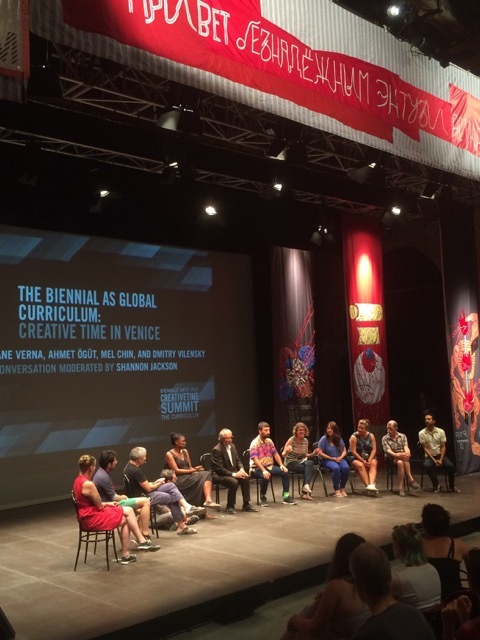 I still am unclear whom Creative Time is supposed to address, specifically in the context of the Venice Biennale: the art world, the practitioners, the public? These questions spur more questions, like who gets to create, who gets to participate, and who gets to assign value to art. The Summit’s closing night party at the Serra Dei Giardini screened films, served spritzes, and was host to the launch of Nato Thompson’s book Seeing Power: Art and Activism in the Age of Cultural Production. In my book he wrote: “let’s figure out this art/politics thing together.” I don’t think this was necessarily directed at me, but at socially engaged artists and activists, and at those who attended and participated in the Summit. The three-day event created a space — “an alternate commons,” as Negri reminded us — that allowed people to reflect on power, interrogate how it’s disseminated, embrace its complexity and contradiction, and keep these artistic practices and all of their curriculums sites of ongoing dialogue. 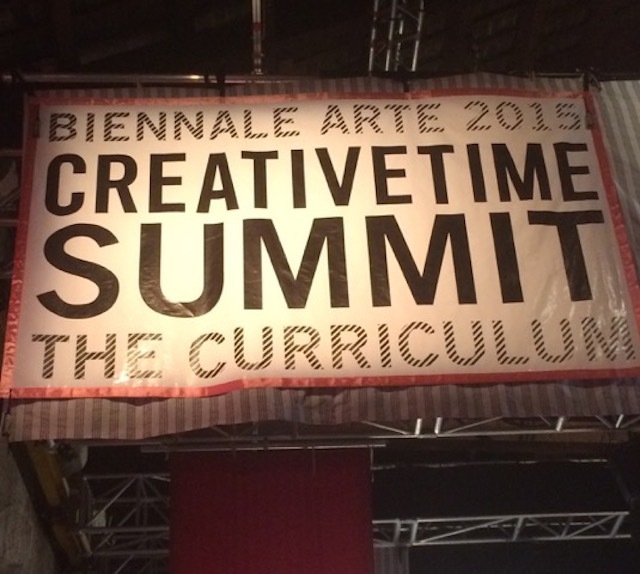 The Creative Time Summit: The Curriculum took place at the Teatro alle Tese (Castello, 30122, Venice) August 11–13. It was featured in All the World’s Futures at the 2015 Venice Biennale.